G-Shock is known for a lot of things, but subtlety isn’t one of them. The Mudmaster GWG1000 does nothing to change this perception. In fact, it goes in the exact the opposite direction with its overtly masculine “Armored Tool Design” case and sturdy, textured rubber strap. Indeed, if any watch screams “manly” at the top if its lungs it’s the Mudmaster, but is it all bark and no bite? Let’s take a look. The GWG1000 is part of G-Shock’s premium Master of G collection, which means, among other things that it rolls off Casio's state-of-the-art Yamagata assembly line in Japan. It also benefits from such high-end touches as a scratch-resistant sapphire crystal, a machined and engraved stainless steel caseback, textured stainless steel buttons and even a carbon fiber second hand, all of which help to justify its decidedly un-G-Shock-like price tag of $750. For your money, you’re getting a lot more than just a tough watch. In addition to the usual features that we’ve all come to expect from Casio – stopwatch, countdown timer, multiple alarms, world time, atomic radio time syncing – you’re also getting a full suite of sensors which makes the GWG1000 a true “ABC” watch (ABC = altimeter, barometer, compass). Basically, everything you need to survive off the grid while shaving with a bowie knife (if you even bother shaving, that is), field dress deer and wrestle grizzly bears can now be worn on your wrist. It goes without saying that you can also use the GWG1000 for casual hiking, but that seems like a waste of its talents. 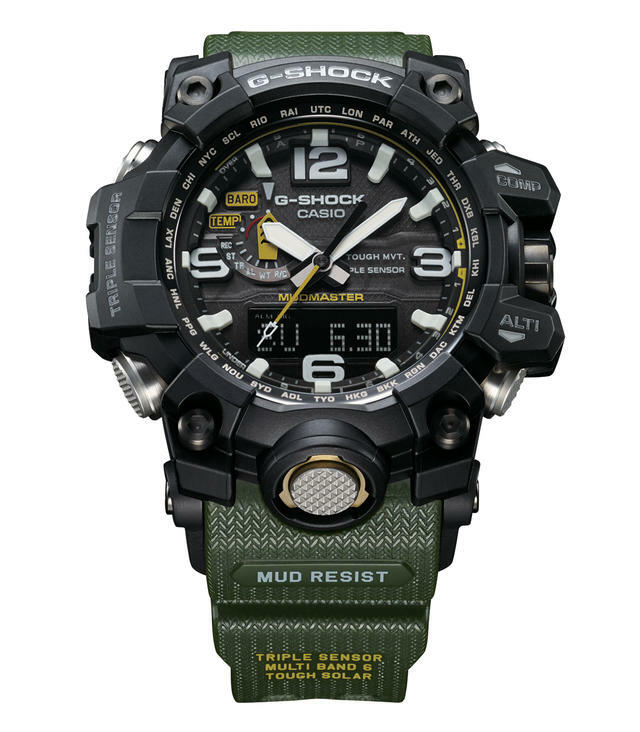 Indeed, it probably does to G-Shock as well, who designed this particular Mudmaster with first responders in mind. To this end, first and foremost, there’s the mud-resistant structure, which was introduced in 1985 with the now-iconic DW5500. That model, and the ones that followed covered the buttons in urethane to prevent the intrusion of dust and mud, but for the GWG1000 a different approach was used. All of the buttons on the Mudmaster, including the front light button, feature a double-gasket structure housed in stainless steel cylinders. Not only does this set up completely seal off the module within, but it also allows for a far more tactile feel when operating the functions. Add to this the generous knurling on the button surfaces, and you have a watch that can be used just as easily with heavy gloves on as without. As for the module itself, it’s a “Tough MVT”, which in G-Shock lingo means that it’s encased within a hardened inner-case and enveloped in αGEL® (Alpha-Gel), a patented shock-absorbing material. This protects the movement from extreme vibrations and shock, and when coupled with its self-aligning hands, which can realign themselves automatically in the case of a particularly hard knock, you’ve got a proper ana-digi timepiece that can take whatever you can throw at it - and then some. A key part of the module are the sensors which are now controlled by Casio’s third generation chip, the aptly named Triple Sensor v.3 which is an astounding 95% smaller than the first generation, and uses 90% less power. The reduced electrical requirements allow for a solar powered battery, while improvements in technology mean much faster and more granular sensor readings. To wit, the compass can now operate for a minute straight without resetting – prior to this, it was 20 seconds – while the altimeter now measures down to 1 meter, whereas before it was 5 meter increments. As someone who owns G-Shocks with the first two generation sensor chips, I can tell you unequivocally that these are practical improvements and make the watch much more effective in its given role. A particularly useful function is the barometer tendency alarm, which can be set to warn the wearer of the abrupt changes in air pressure that presage bad weather. Indeed, the watch accurately predicted a nor’easter that blew through the New York City area not that long ago. There’s also a thermometer, because why not, but in practice you have to take off your wrist for at least 20 minutes if you want an accurate reading, which makes it less than useful for on-the-fly readings. That said, if calibrated correctly, it is spot on. Of course all of this is for naught if the end result winds up being completely unwearable and/or confusing to operate. Here’s where the Mudmaster truly shines. For all its outwardly macho posturing, the watch is supremely comfortable on the wrist. In spite of its size, it’s relatively lightweight, and thanks to the “wings” on the case back, which flow gently into the textured band, even those with small wrists will find it comfortable to wear. There’s a raised tab on the end of the strap that prevents the keeper from getting loose, and in spite of the semi-shrouded buttons, which mitigate accidental actuation, they remain easy to use. 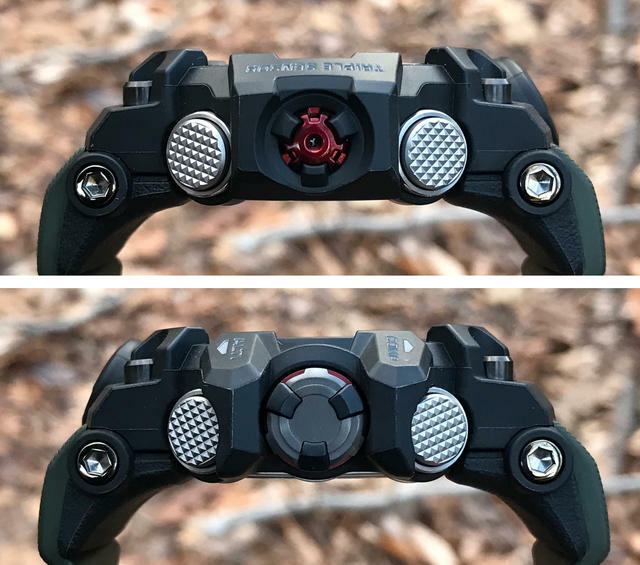 From an operational standpoint, the GWG1000 features dedicated buttons for the dual LED backlight, compass and altimeter, which allows for quick spot checks of the readings, day or night. Even better, all adjustments can be made though the innovative screw-down Smart Crown, which works just like the crown on an analog watch, but in context depending on the mode that the watch is in; a bright red band warns the wearer to screw it back in after use. 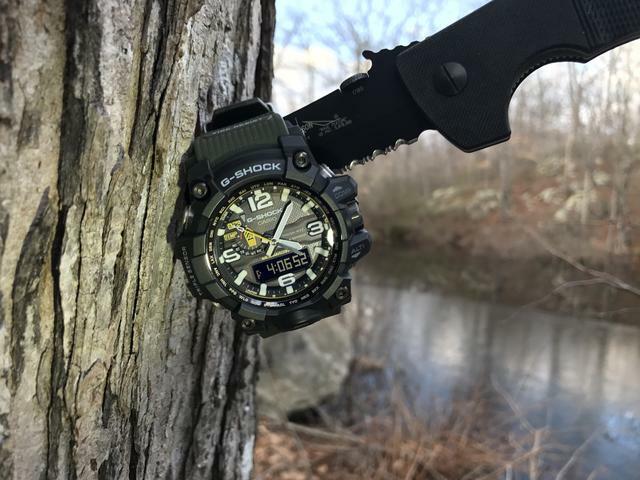 Another example of how G-Shock has clearly thought through the real world use and application of the Mudmaster functionality. If the hands happen to be blocking the digital readout, simply press two buttons in tandem and the hands swing smoothly out of the way for a clear view of the digital readout. For a no-compromise watch, there are a few surprising omissions, however. There is no tide graph, moon phase or sunrise/sunset function. If you just want the sunrise/sunset info, you’ll have to step down to the all-digital Rangeman; if you want all three, you’ll have to step up to the Gulfmaster GWNQ1000, which also features a depth gauge, although, in the case of the latter, you will sacrifice the trick double-gasket buttons and mud-resistance in the bargain. 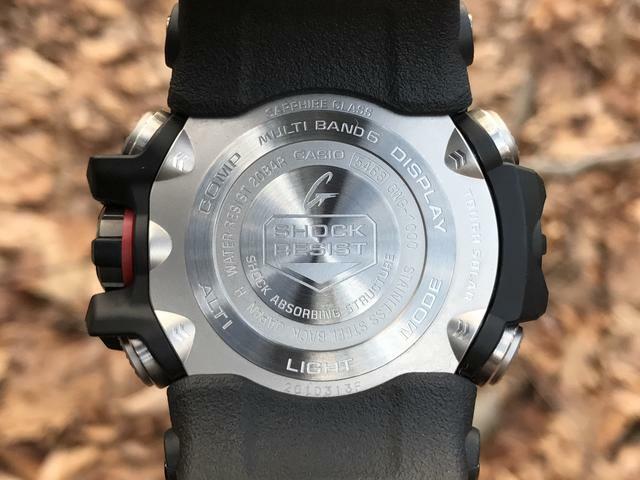 Obviously, this fits with Casio’s positioning of the Master of G line, with the Gulfmaster correlating to the sea, while the Mudmaster is the land-based member of the family, we can see more than one scenario where a dedicated outdoorsman would have occasion to use some of these features inland. One minor complaint is that the countdown timer maxes out at just one hour, which is far too short, particularly when 24hr timers are a dime a dozen in G-Shock’s portfolio. 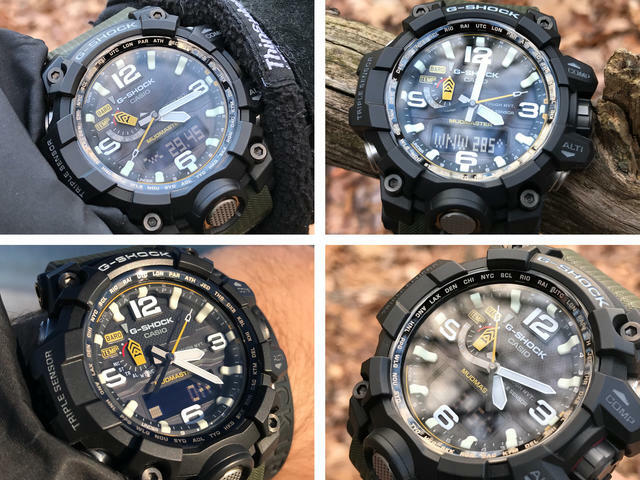 Still, when it comes to absolute toughness, there’s little use denying that the Mudmaster GWG1000 rules the G-Shock roost. Not only does it look the part, but it follows through with features galore, thoughtful ergonomics and all-day wearability that makes it a great companion for the outdoors. 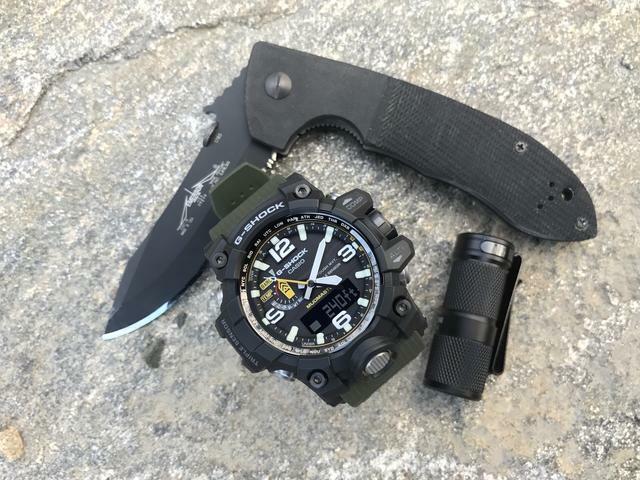 Sure, we’d like to see the addition of at least a sunrise/sunset function, but all things considered, if we were about to head off into the wild with nothing but a knife on our hip, a pack on our back and adventure in our hearts, the GWG1000 is the first watch we’d reach for. 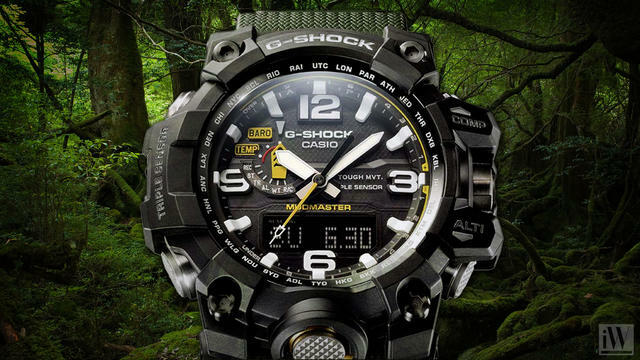 To learn more about the Mudmaster GWG1000, visit G-Shock’s website.